PHE Canada, with their supporting partner The Co-operators, recently awarded New Germany Elementary School and New Germany Rural High School with a grant award of $2000 from their Share2Care Mental Health initiative. By championing positive mental health among students and school staff, the two schools were chosen as a recipient of this award; chosen among 226 applications from across Canada. Both schools have a Free Store – a clothing, food and essentials locker that can be accessed by families in need; work that furthers their support to students, parents and guardians. 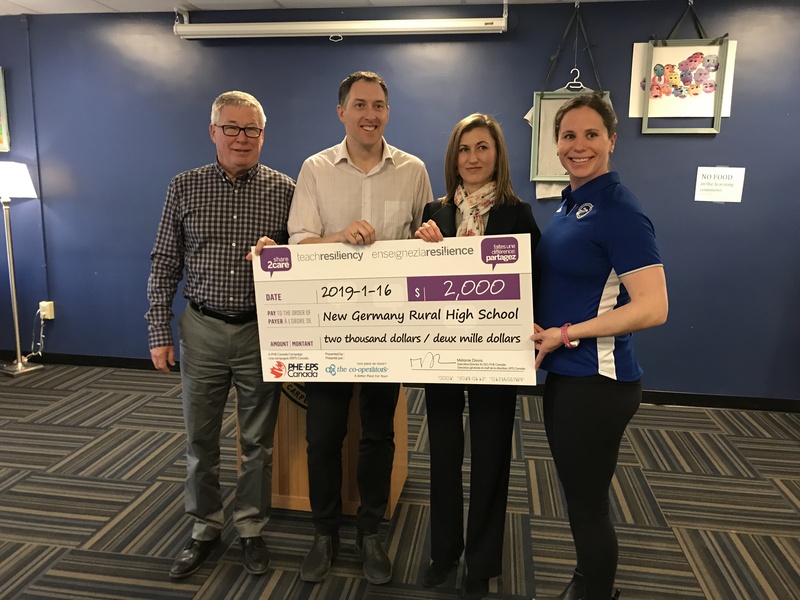 On Wednesday January 16, 2019 representatives from PHE Canada and The Co-operators visited New Germany to make the cheque presentation. Also in attendance were students, staff, Regional Centre for Education representatives, local media and Cathy Moore, Deputy Mayor for the Municipality of the District of Lunenburg. The Free Store is a good idea because it has things that people need. I have been able to get mittens, a hat, apple juice and other products. I even got clothes and new a toothbrush. These things help me and my family because sometimes we don’t always have what we need for everyone at home. The Free Store allowed me to “shop” from the shelves and take it right home and it should continue because people are using it and if we did not have it people might not have what they need. It makes me feel taken care of. The free store is important to me because when I’m hungry I know that I can go up there and get whatever I need. I’ve even got some clothes and shoes from it. It’s awesome. They also have school supplies. It’s really helpful. I like having the Free Store because we can get things to take home right away. Sometimes my dad gets paid a long time ago and there might not be enough money. I have packed crackers, soup, Kraft Dinner in my backpack and we can use it that night. Things at the real stores are sometimes way too much for us to afford. Having breakfast, lunch and supper is important so you can do your math without thinking about being hungry. The free store is a great place to get food and anything else you need if you can’t afford it. I know I can go there when things are tough. It makes me feel better to know there are things here that I can get without having to worry about money. When I first heard about the free store, I was like “okay–that’s going to be nice, going into a place and having everyone judge you.” Then there came a time when my family was in need. Now, I’m not one to who’s surprised very often, but I can honestly say that my first time at the free store was great. When I showed up, nobody knew I was coming. They just let me in, and told me to take whatever I wanted. Nobody stood there and watched me. When I got into the store, I saw all of the reusable bags they provided and I was able to fill up on food. Then I turned and saw all of the clothes and shoes they had. Families can even get hygiene products and detergents–even baby food and diapers. My kids also access the store when they are at school, and have come home with food and coats. To all of the people who started this, the supporters, donators, and staff I want to say thank-you for making a difference for my family. Thanks for bringing this to our community–it is greatly needed! Congratulations to both schools for their efforts and being community champions! Schools have become more than just a place to learn the basics of math, science, reading and writing and this is especially true for schools in more rural areas such as New Germany Rural High School and New Germany Elementary School. 1 in 5 students in our school region live at, or below, the poverty line creating challenges that can’t be overcome with the traditional services and structures of schools. With many services either in more “urban” areas or satellite services not being consistently accessible in the community, we are a piece of the puzzle to ensure students and their families have what they need to succeed. The concept of the Free Store emerged from this need. Last year at the high school, there was a plastic cart that housed school supplies and other personal items for students and families. At the elementary school, clothing swaps happened at parent teacher nights and other functions. In addition, when the Early Years Centre was created many outreach programs began – parent cooking classes were offered where crockpots and supplies were sent home. This year, both schools have expanded their services to include more clothing, winter wear such as boots, snow suits, and even hand knit mittens/hats, personal hygiene items, non-perishable food items, along with household products including laundry soap and diapers. Because of the on-site Free Stores, our help is immediate, responsive and making a difference. The success of the Free Store comes from the generous donations from our community members, our own school staff and students, community businesses, and from grants like the one we are received from PHE Canada. Good mental health is integral to our overall well being, and our mental health and many common mental health disorders are shaped to a great extent by the social, economic, and physical environments in which we live. It has been observed that social inequalities are associated with increased risk of many common mental health challenges. By taking action to improve the conditions of daily life through the support of our Free Store from pre-primary through to grade 12 students, we are hopeful that we can reduce the risk of those challenges that are associated with social inequalities and help to create a stronger community ultimately leading to brighter futures for our students.